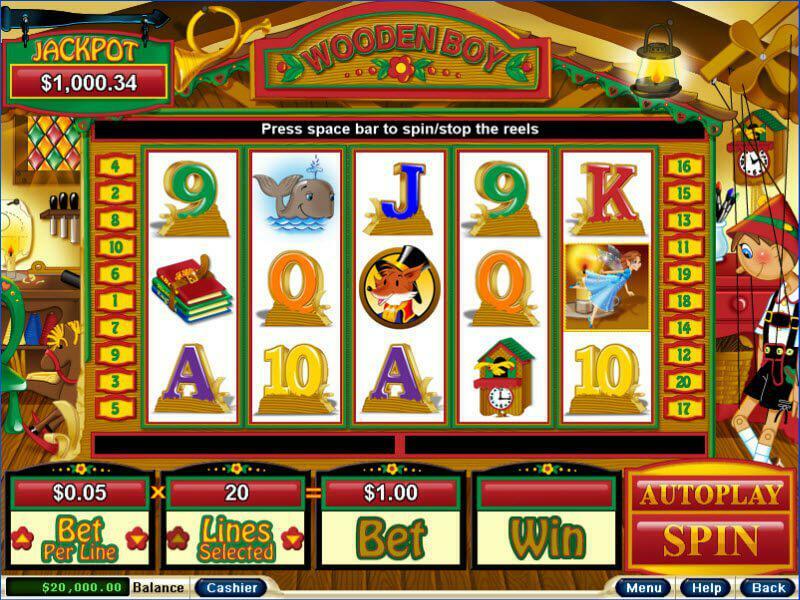 It stands to reason that a game called 'Wooden Boy' must be about Pinocchio and this game takes the age-old story of the wooden boy whose nose grew every time he lied and gives players the chance to win with every spin. Created by Realtime Gaming, the game has 20 paylines and features a number of elements that will boost your chances of winning including free spins, expanding wilds and multipliers. If you were wondering whether all of the characters from the classic children's novel make an appearance, here's your answer: yes, they do. There's Geppetto, the kindly puppeteer, the whale, the blue fairy and even the sassy fox in his top hat, all symbols you'll see when you play at Yebo Casino. This is the kind of game that is perfect for experienced and for new players, since it offers the chance to make high or low bets. When you do place your bets and press the spin button, you may notice that it turns itself into a stop button, so that you can stop the reels whenever it suits you. While this may not increase your chances of winning, it will certainly speed up the game. The slot's top fixed payouts are small but decent with a top fixed payout of 1 000 coins for finding five of the clock symbols. You'll only get 500 coins if you find the fox but if you made the maximum wager, that's still a few thousand rand. As mentioned above, the wild expands and this is Pinocchio himself. Find him and he will act as a substitute for any of the other symbols, which is a great way to get his help in completing a winning combination. He will not substitute for a scatter though, which is the blue fairy, who has a few magical tricks of her own to help you collect more cash. The scattered fairy has the power to grant you up to 100 times what you initially wagered and she is the key to unlocking the bonus feature, in which Pinocchio will add a three times multiplier for you. Now, here's the news that will get you playing the game right now. The progressive jackpot, at last count, was sitting at over half a million rand. Since it's a random jackpot, you'll obviously need to keep spinning the reels in order to try and claim it as your own, but if you don't play, you could be missing out on becoming very rich indeed. Even if you don't have the time to put into the game yourself, why not take a few minutes to set up the autoplay feature, which will spin the reels for you and try to catch that progressive jackpot on your behalf. This is a great game and that's no lie. If you haven't played it in the past, we really recommend you do so now because not only is it a charming game that will take you back to your childhood, it has a massive progressive that you should not miss out on.